Renault Kwid was engineered keeping in mind the demand for emerging markets and priced in such a manner of success. The company had to cut down cost on safety features and body quality to achieve VFM pricing, The Kwid went through its first crash tested in 2016 by Global NCAP and awarded zero stars. Then the company made some minor changes to the body, which helped the model to attain at least 1 star. 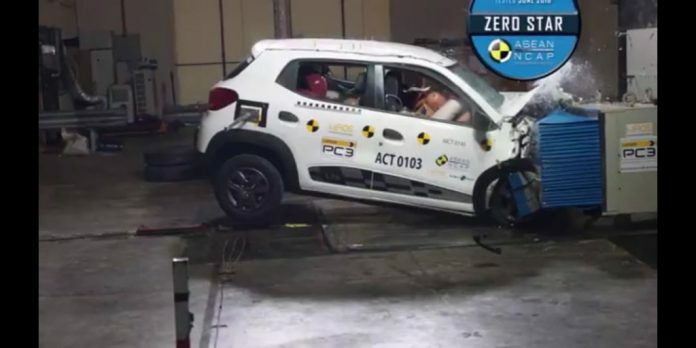 Recently a Crash test was conducted by New Car Assessment Programme for South East Asian Countries (ASEAN NCAP) for the Renault Kwid, which was sold in Indonesia and it is made in India. The test went very bad as the Kwid scored zero stars yet again. The model tested for ASEAN NCAP featured driver side airbag as an only safety feature available on the hatchback. 14.56 points in Child Occupant Protection (COP). 0 points in Safety Assist Technologies (SATs) as it doesn’t come with any safety assist technologies. The overall score of Kwid is 24.68 points and ASEAN NCAP rated zero stars. ASEAN NCAP Secretary-General, Ir. Dr. Khairil Anwar Abu Kassim told that he was disappointed with the test results of Kwid. He added that The Kwid scored 3 out of 5 stars in Latin America crash test by making a safer version, but why they are not making the same version for South East Asia. Renault strategy of different regions and double standard is deeply disappointing, he added. Renault Kwid made for The Latin American market is almost 140 kgs heavier than the Indian version as the company has given extra structural reinforcements along with the use of high strength steel to make the body stronger. Renault offers four airbags, ABS and ISOFIX child seat anchor points as a standard for Brazil. In India, Renault Kwid comes with two engine options an 800 cc and 1.0 L units. These configurations comes with a 5 speed manual as a standard offering and an AMT option available with 1.0 L engine.